Distributor: Currently licensed in North America by Aniplex of America. Also streaming on Crunchyroll. Related Series: Upcoming second season. Youngsters Emma and Norman discover (not entirely by accident) that being "adopted" out of their Grace Field House orphanage actually means being selected for a cruel fate. With the clock ticking toward their own turns to face this, they try to devise a plan of escape- but the more they add to their almost non-existent information about this place, the more it seems their adversaries have covered all the bases. Even with the cynical Ray on board, can they get away from "Mom" (a woman named Isabella, who's both their guardian and guard)? And how many of the other kids can they free as well? Emma, Norman, and Ray seem impossibly precocious for not-quite twelve-year-olds: they make (usually) correct inferences about their opponents based on very slender evidence, and devise amazingly sophisticated strategies (and counter-strategies) that surprise the viewer as much as their foes. One would normally think that, given their intentions, their captors would prefer the kids to be kept fat and stupid, but no; we are given a rationale for the kids being allowed to develop intellectually- but wouldn't it STILL be more logical for the knowledge of certain things (like, for example, tracking devices) to nevertheless be suppressed? Instead, the place is filled with books- not only in the kids' dorms, but even in "Mom's" inner sanctum. It's fitting, though, in a way- for this show is a thinking person's thriller, and to make that work, the older kids, at least, have to reason like adults; I got the feeling that the characters are in children's bodies more to get that extra layer of concern one has for kids in peril. Recommended Audience: Another anime series that is inappropriate for the age group of its cast. While only a few scenes are actually shocking/explicit horror, the pervasive nature of the horror here makes this Not For Children. We'll say 16+. 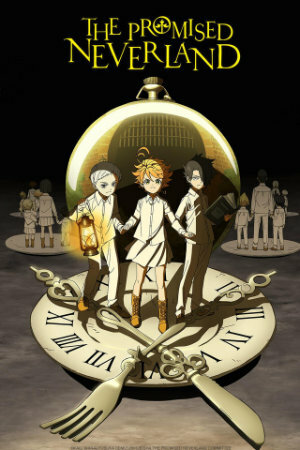 The Promised Neverland (Season One) © 2019 Cloverworks.